It is no secret that I love everything about the summer. The trips to the beach, the soaring temperatures, the longer days, & the sundresses, however, there is one thing that I can't do in the summer: layer. One of my favorite parts about fall is the endless outfit combinations that can be created by layering pieces. Here's to lots of mixing & matching & layering this fall. PS. My shop page has been updated! Check it out for some additional fall style inspiration! Love this outfit! It is super cute and I love all the layering! Hope you have a wonderful weekend! Thank you so much! Hope you are doing something fun this weekend! Yes to layers! I love my chambray shirt, and I can't wait to start layering it when it gets cooler! Me too! My chambray top is one of my most worn pieces! Ah! 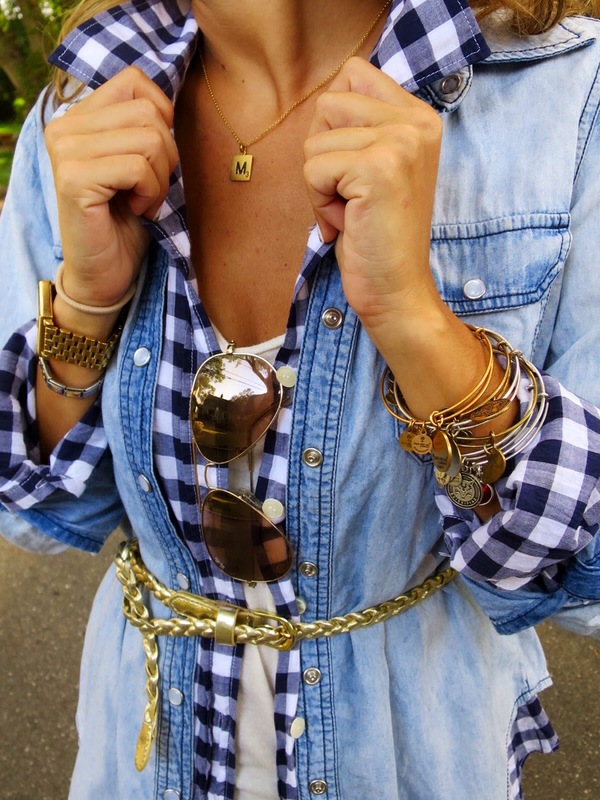 Love this outfit and how you layered your chambray and gingham shirts. Love the Alex and Ani bracelets too! I wear an armful of them almost everyday! you are too sweet :)! Wonderful composition the 2 shirts! You look adorable with those skirt, Michelle! I also love how you used your gingham shirts.